Born with a scarlet mote in her left eye, Phedre no Delaunay is sold into indentured servitude as a child. When her bond is purchased by an enigmatic nobleman, she is trained in history, theology, politics, foreign languages, the arts of pleasure. And above all, the ability to observe, remember, and analyze. Exquisite courtesan, talented spy... and unlikely heroine. But when Phedre stumbles upon a plot that threatens her homeland, Terre d'Ange, she has no choice. Betrayed into captivity in the barbarous northland of Skaldia and accompanied only by a disdainful young warrior-priest, Phedre makes a harrowing escape and an even more harrowing journey to return to her people and deliver a warning of the impending invasion. And that proves only the first step in a quest that will take her to the edge of despair and beyond. Phedre no Delaunay is the woman who holds the keys to her realm's deadly secrets, and whose courage will decide the very future of her world. Not since "Dune" has there been an epic on the scale of "Kushiel's Dart"-a massive tale about the violent death of an old age and the birth of a new. It is a novel of grandeur, luxuriance, sacrifice, betrayal, and deeply laid conspiracies. A world of cunning poets, deadly courtiers, deposed rulers and a besieged Queen, a warrior-priest, the Prince of Travelers, barbarian warlords, heroic traitors, and a truly Machiavellian villainess... all seen through the unflinching eyes of an unforgettable heroine. Born in 1964, Jacqueline Carey was an avid reader since early childhood. She began writing in high school, not realizing her hobby would become a permanent vocation. After receiving B.A. degrees in psychology and English literature from Lake Forest College, she spent time living in London and working in a bookstore, then traveling throughout Europe. While living abroad, the desire to become a professional novelist emerged as a driving passion. Upon returning she embarked in earnest on a writing career, which came to fruition some ten years later. During this time, she worked at the art center of an area college, gaining a strong background in the visual arts. This, along with her early studies in literature and psychology informs her work, as does a lifelong interest in mythology. She enjoys doing research on a wide variety of arcane topics, and an affinity for travel has take her from Finland to Egypt to date. Although often asked by inquiring fans, she does not, in fact, have any tattoos. Jacqueline currently resides in west Michigan, where she is a founding member of the oldest Mardi Gras krewe in the state. 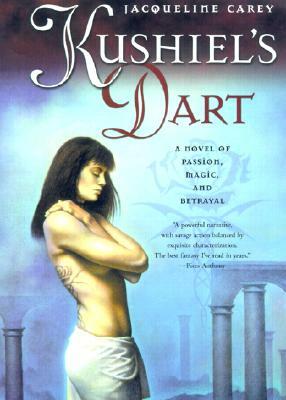 She is the author of the critically acclaimed Kushiel's Legacy fantasy trilogy, including "Kushiel's Dart," which received the Locus Award for Best First Novel and the Romantic Times Reviewer's Choice Award for Best Fantasy in 2001. Other previous publications include a nonfiction book, various essays and short stories.